There are some fundamental points in the Christian faith that, if you simply do not believe, then there’s seriously no point in calling yourself a Christian, because if these points do not stand, this entire faith falls. Things like if you do not believe in Genesis 1:1 [Article], i.e. you do not believe that God created the heavens and the earth, or, worse, you do not believe that God exists – so if God wasn’t mighty enough to create the heavens and the earth, or, worse, if God doesn’t exist, you really have no reason to read on, for this faith is a weak one. In 1 Corinthians 15, as Paul teaches the Church of Corinth – who are very academic and knowledge people during the advent of Greco-Roman philosophy, and at a time when the pursuit of rational and proven knowledge was a very ‘in’ thing – the teaching of resurrection, he’s pretty much telling them the same thing: think for yourself! If you insist on not believing this, if you insist that Christ has not been raised – then this faith is not worth believing. In this study, we will look specifically into the resurrection of Christ and how fundamental it is – that our faith would be not worth believing if Christ has not been resurrected. And if Christ has not been raised – The previous verse saw Paul questioning the people of Corinth, who weren’t so much vocally dispelling the fact that Christ has been risen from the dead, but engaging in debates regarding the resurrection of the dead –But if it is preached that Christ has been raised from the dead, how can some of you say that there is no resurrection of the dead? If there is no resurrection of the dead, then not even Christ has been raised [1 Cor 15:12-13]. Unfortunately, sometimes things that seem unrelated to our Lord and unrelated to our faith has huge implications to it. You can have your own set of secular morals, principles and beliefs, but you’d be kidding yourself if you think that it has nothing to do with Christianity. Paul reiterates the importance of the main points of the Christian gospel in this chapter – that Christ died for our sins [1 Cor 15:3], was buried and raised on the third day [1 Cor 15:4], appeared first to Peter then to the Twelve then to hundreds of brothers-and-sisters, many of whom are still living witnesses [1 Cor 15:5-6], and then appearing to James and the apostles, and finally, to Paul himself [1 Cor 15:7-8]. Paul spent some time detailing the process of Christ’s appearance after his resurrection – he listed them by name and by title, so as to establish the fact that the resurrection of Christ is not a baseless rumour nor a myth – it is a fact, proven by the testimonies of many, including Paul himself. Christ’s appearance after his resurrection is not so much a fundamental point in theology, but merely an small extension to the resurrection point. Still, it was necessary and intentional that Paul emphasized on it – For if they cannot believe that Christ appeared to many after his resurrection, many of these witnesses who still are living, then how can they believe in the resurrection of Christ? If they cannot believe that Christ has resurrected, how then, can they believe in this gospel, and how then, can they be saved – By this gospel you are saved, if you hold firmly to the word I preached to you. Otherwise, you have believed in vain [1 Cor 15:2]. 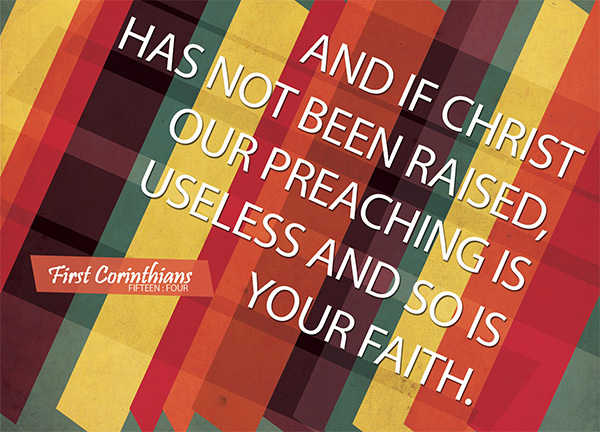 Paul himself states one immediately – our preaching is useless, so is our faith. Why? Why would it be useless? Even if Christ remains dead, he was once alive, wasn’t he? It still remains a fact that he came to redeem us of our sins and died on the cross for us. Isn’t that enough? Unfortunately, that isn’t. If Christ had not risen, then the numerous Messianic prophecies that details his revival would have been false – which basically implies that God is lying. Even Christ himself had foretold his own death and resurrection [Mark 8:31, Matt 17:22, Luke 9:22]. Hence, Jesus would be a liar too. The numerous disciples, apostles and believers who claimed to have seen Jesus after his death would have been liars too. And because they are liars, all the scriptures would have been unreliable. Genesis 1:1 would have been unreliable. The ‘fact’ that God exists and he created the heavens and the earth would have been unreliable. The promises made in the Bible regarding the future, regarding salvation and eternal life, regarding a place in the courts of God – all these would have been unreliable. There is no longer any meaning in believing a faith woven together by a bunch of unreliable sources and lies. There is no longer any meaning to preach about a gospel that doesn’t necessarily carry hope and salvation. For if our Lord is not risen, he is but just a dead god. If our Lord cannot overcome death, who are we to think that we can overcome death and attain eternal life? The list of implications can go on. But it is fundamental that we understand and believe that God cannot lie – God is not human, that he should lie, not a human being, that he should change his mind. Does he speak and then not act? Does he promise and not fulfill? [Num 23:19] And we need to believe in the Bible, which has lasted through the centuries, no, the milleniums, and yet stayed in one piece. Translation and interpretation errors will continue to exist as long as you’re not a native Hebrew, Greek or Aramaic speaker. If you debate over things like methods of baptism, that’s one thing. It’s a whole other matter altogether to debate whether Christ is risen or not; or whether God created the world or not. I’m by far not the best person to speak on the inerrancy of the Bible – there have been many apologetics books on that topic itself, which provides historical and scholarly evidences. But as a lay Christian I understand the importance of certain theological ideas in the Bible – including the resurrection of Christ. I was born into a Christian family, and hence it has never been too difficult for me to accept that since I learnt that Jesus was resurrected before I learnt enough general science or common sense to know that revival is not possible (by men). But it certainly is not something easy to believe, and I’m sure many other people are standing at the bylines and laughing heartily at us – us who believe that a dead man can be revived. Want to walk the Christian path? Want to hold on to this faith? There are hurdles to cross, and the very first one would be our own beliefs. Thank God for the fact that Christ had been raised, and hence our preaching is meaningful, and so is our faith.